Scores of local and Aussie businesspeople gathered at JW Marriott hotel in Banpo-dong, Seocho-gu, Seoul to exchange greetings and information about doing business in South Korea on June 26, 2009. 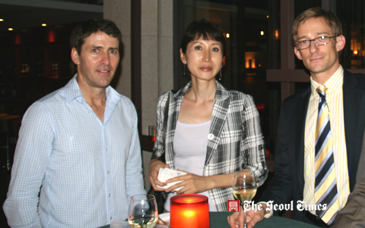 The business gathering called "Sundowner" is the dinner party hosted by Australian Chamber of Commerce in Korea. The networking event started at hotel's Bar Rouge at 6:30 p.m. and finished around 10 p.m. on the day. There were 45 guests including representatives from the party sponsors at this "Sundowner." Dr. Gina Sohn (center) of Tufts Dental poses with other guests. Both Korean nationals and Aussie and other businesspeople hobnobbed with each other, enjoying buffet menu with Mediterranean style dishes of pasta and crispy fresh salads, accompanied by wines and beer, and mouth-watering deserts. There were prizes for the winners of the singing competition. Among the participants were Ms. Erica Kim, business development manager of The Executive Centre; Mr. Ulf Egestrand, CEO of TAU Consulting Services; Mr. Paul Gaylard, senior project manager of Parsons Brinckerhoff Korea; James E. Morrison, solicitor of New South Wales; and Dr. Gina Sohn of Tufts Dental. Two AustCham directors also attended the party: Jean Ough and Nashah Lee. Mr. Jean Ough is the treasurer. He is representative of Government of Western Australia Trade and Investment Office, Korea. Mr. Ough has a range of expertise and experience with the several multinational companies in relations to IT and Finance. He has appointed as representative since Dec 2008 at the Western Australian Trade and Investment Office and promoted Western Australia as a brand through trade and investment in all industry sectors between WA and Korea. The sponsors are classified into two groups — Gold (GS Caltex) and Silver (AGS FourWinds). AustCham 2009 Gold sponsors are Australian Education International (AEI), Australian Trade Commission (Austrade), BHP Billiton, GS Caltex, Macquarie, McDonald's, Mercedes-Benz, MLA, POSCO, Rio Tinto, Tourism Australia, and Woodside Energy. AustCham 2009 Silver Sponsors are AGS FourWinds, ANZ Bank, BADA Education, DIAGEO, Hyatt Hotels, KOKOS, KPMG, and TIMESTUDY. Their financial contribution and support ensures the Chamber continues to flourish. Winner of AustCham Idol competition was Mr James Rhee singing Tom Jones' classic "Delilah." AustCham Korea (the Australian Chamber of Commerce in Korea) was founded in early 2009 with the purpose of promoting Australian business in South Korea. AustCham Korea (www.austchamkorea.org) was formed after its predecessor ANZCCK (New Zealand Chamber of Commerce in Korea was desolved into two seperate chambers of each nation. ANZCCK lasted from 2001 to 2008. 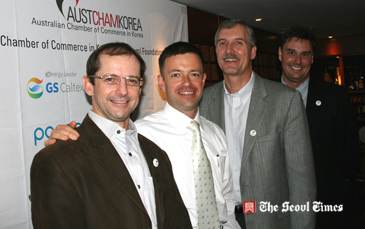 AustCham Korea was created to give an independent voice for Australian business in Korea. AustCham Korea is led by Chairman Sean Rodrigues, chief representative of Woodside Energy Australia in Korea.